• Overall the district has been classified as Minimally Food Insecure (phase I) with more than 83% households are able to access and consume food without shifting their traditional livelihood strategies. • Households have food stock for more than 4 months; an increase income of (2- 5) % (NPR 133.6 million) from sale of livestock products (meat, milk, egg); increase income of 13% (NPR 70 million) from sale of cash/ vegetables and citrus fruits as well as good wage opportunities in construction activities supported by DDC/ VDCs/ Municipality in 18 VDCs of cluster A. • Similarly, households have food stock for (3- 4) months due to recent harvest of paddy, millet and remaining stock of maize. More than 60% households have an increase income of 13% (NPR 287.4 million) from sale of cash/ vegetable and citrus fruits; increase income of NPR 200 million from livestock products (meat, milk, chicken and eggs) compared to this season last year as well as good wage employment in construction and agricultural fields in remaining 18 VDCs of cluster B. • An estimated, NPR 648 million remittance inflow during this period as reported by majority of banks and IMEs. • Market price of major commodities has been hiked up to 20% compared to the price of this season last year. The price of coarse rice (from NPR 35 to 40) has been increased by 14% across the district. • Estimated, 80% households have safe drinking water supply by more than 15 liter/capita/day including 74% have sanitation facilities over the district. • Additionally, the acute malnutrition is reported to be normal with underweight less by 1% as well as normal situation of diseases out breaks. 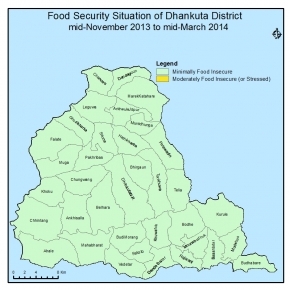 • All the VDCs are expected to be remained normal as Minimally Food Insecure across the district for the period (3rd trimester) of 15 March- 16 July 2014. • Households' food stock will be replenished with their own stock (paddy, millet and maize); able to access to the market purchases including nominal harvesting of wheat entire the district. • Income from sale of livestock products (milk, meat, eggs, etc.) and different types of cash/ vegetable crops; income from wage employment in construction and agricultural fields as well as remittance inflow are expected to be continued. • Stock of main staples will be sufficient to meet the demands since good road network from major markets to regional or sub- regional markets. However, market price is expected to be hiked due to impact of price rise in petroleum products and lean period. • Additionally, water supply system and sanitation facilities are predicted to be operational with normal situation of human diseases and climatic hazards.